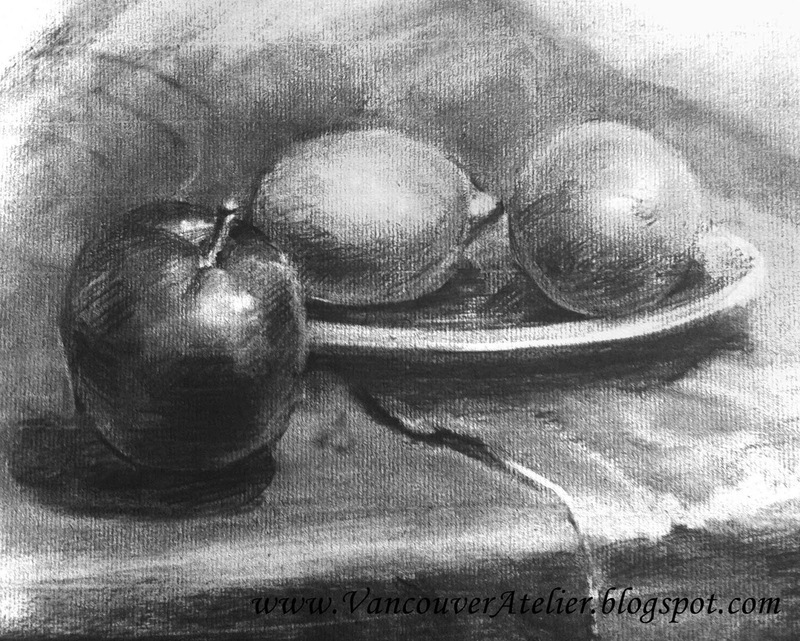 Vancouver Fine Art Atelier: Drawing still life with charcoal. Drawing still life with charcoal. 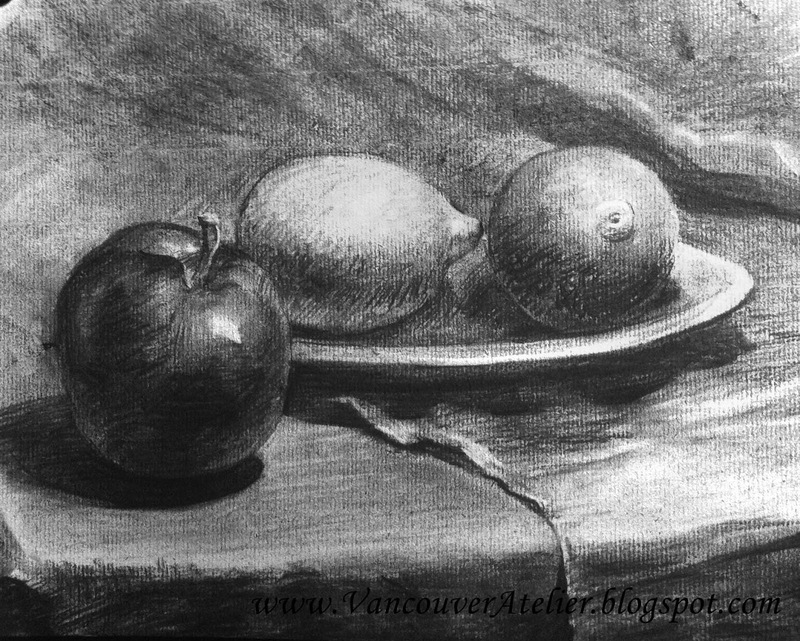 Still life studies can be the simplest subjects to practice your drawing process with. They don't move, it’s easier to control the settings of the composition such as light, position of objects, and perspective. 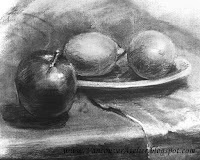 Charcoal drawing is a well-recognized traditional medium. 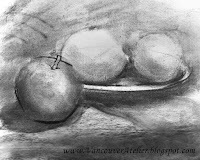 Very professional-looking black-white images can be drawn just with a little chunk of charcoal and an eraser. It is also a great way to learn tonal relations and lighting techniques. 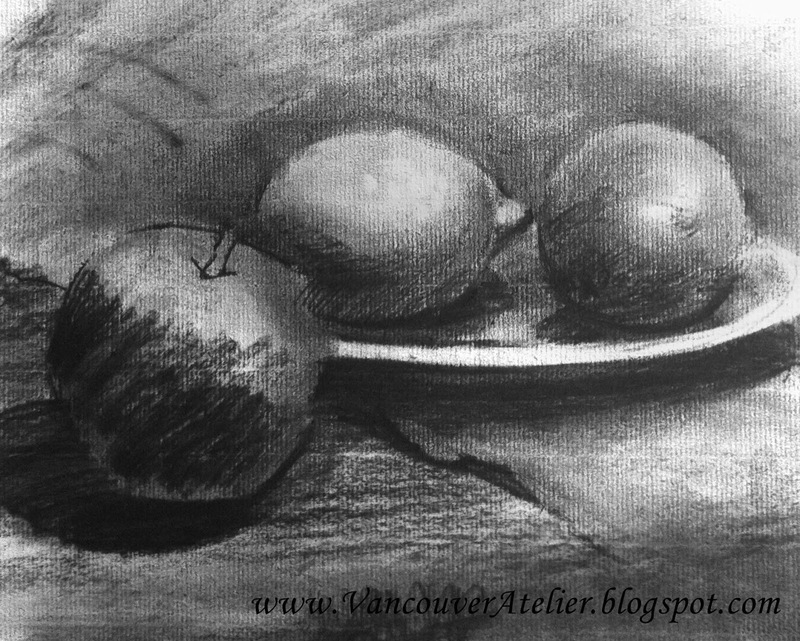 So here are a few steps of drawing a simple still life using charcoal. This time I used mostly a “hatching” technique, similar to using a graphite pencil. 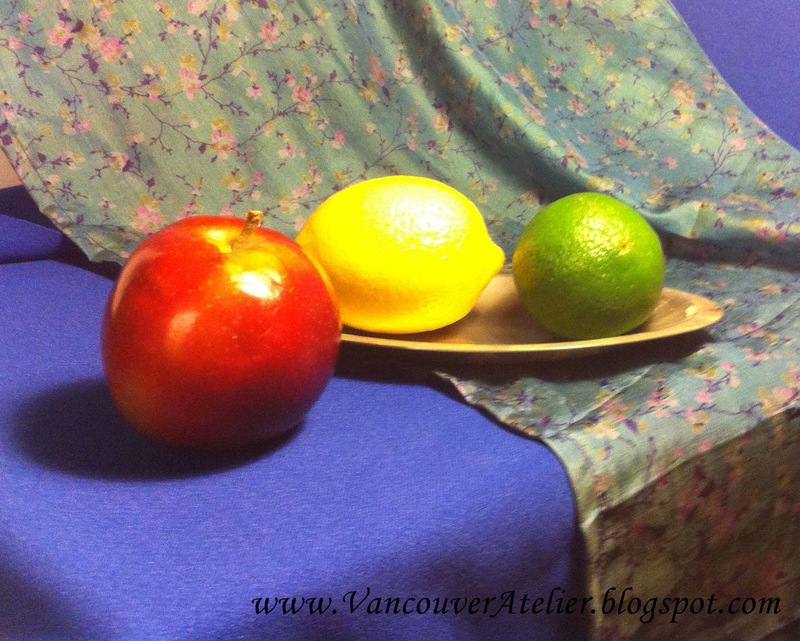 Set up a cheerful still life with any fruit of your choice. 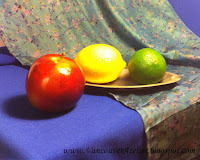 For this lesson I used an apple, lime, lemon, and purposely choose some bright colored drapery for the backgrounds to make the whole image interesting to look at. 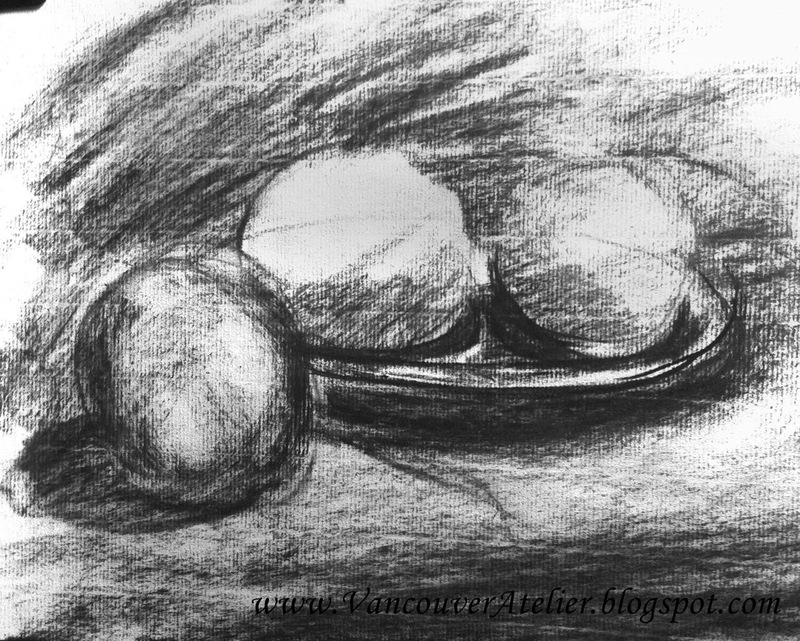 Prepare the materials you will need: charcoal paper (here Strathmore 9"X12"), willow charcoal (medium and small), paper towel, your fingers:), kneadable eraser, and white tape. I suggest clipping or taping your paper on a wooden board/panel. Tape it around all sides so that when you will take the tape off you'll have a nice 0.5 inch frame on the paper. Set up the light and choose the drawing angle you like. 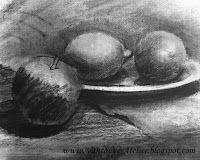 Then begin with drawing just a few light marks, on the future places of your fruits. 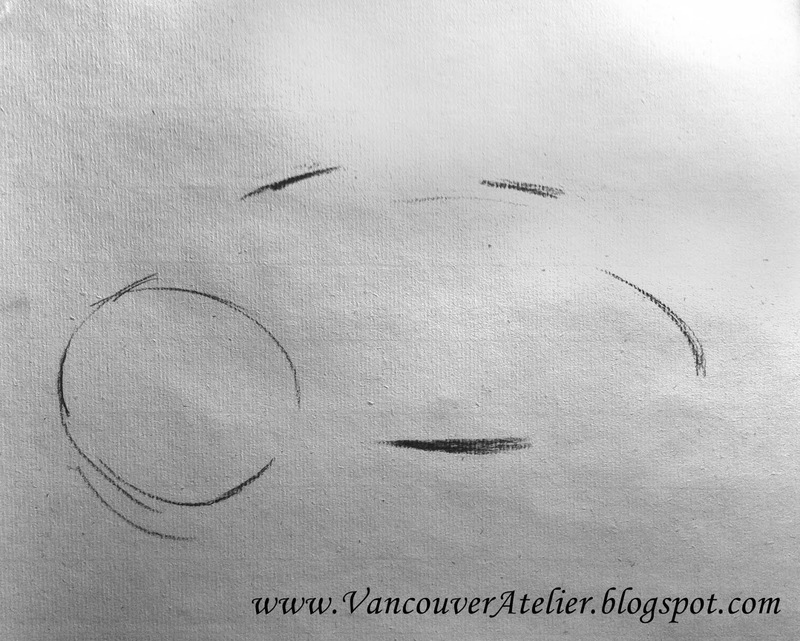 Make sure that composition of your drawing already looks nice, so objects are not too big and not too small, the whole shape of the objects should be slightly higher than the center of your page. 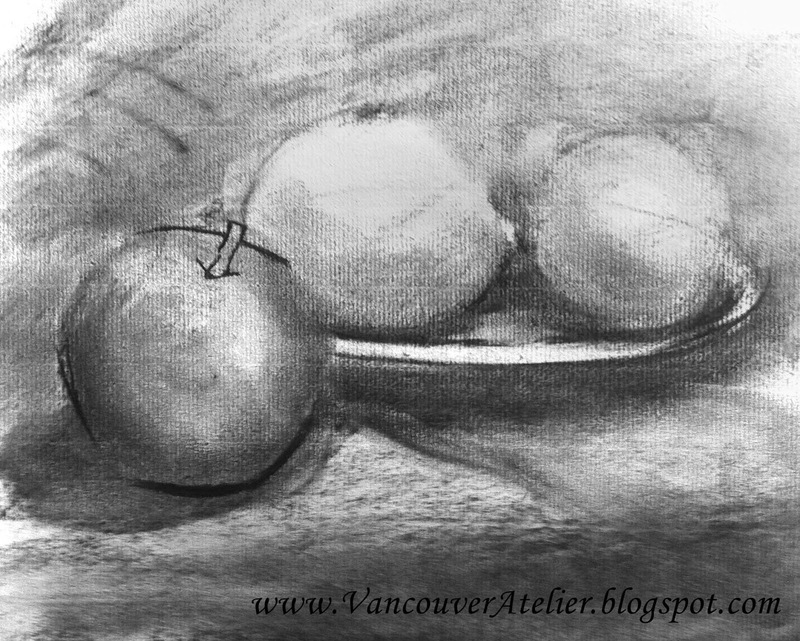 Do not spend too much time drawing accurate, because charcoal is a very movable material, and some lines will disappear as you will start putting hatching. Continue with drawing basic shapes of your fruits with lines. Apply rough shadow hatches on the objects and the background, using side of your charcoal. Leave the lights un-touched. Play with using different pressures of charcoal and the process will get easier. Try not to concentrate on details, show only simple forms of objects. Work the foreground and background together. Prepare your paper towel by folding it a few times and go for smoothing all of the shapes and contours. After that take a smaller charcoal and add some detail in to your drawing. Draw all of the shapes carefully; exaggerate objects in a way of showing their character more clearly. At this time you have chance to fix proportions and the composition design of your drawing. 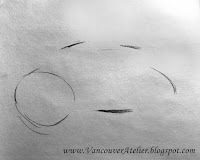 When your done with smoothing and adding the contours, you should begin to apply the contrast onto the drawing. At this stage do not rush and take your time to compare tones and volumes of different places on the still life. Remember: it is never too late to adjust the position of any object on the drawing. Use your fingers, paper towel, and charcoal to do the changes. The next stage begin by working foreground to background. The foreground objects (drapery, fruit closer to you, front of the plate) should have more contrast then background objects. Keep your attention on showing the differences of materials on your still life. Carefully apply textures on fruits and fabrics. The detailing is also exaggerating and showing the specifics of the individual object qualities. On the final stage try to soften some details and work on the whole composition. For example darken the background if it will help to show brighter light, or add some more folds on the foreground to keep the viewer's attention closer to fruits.A good idea will be constantly looking at your drawing from the distance, or even up side down.